This is from a tapelift from a home impacted by a near approach of a large forestfire. This has the form of the original calcium oxalate crystal but has been converted to poly-crystalline calcium carbonate. Calcium oxalate phytoliths are present in two chemical forms and in many different crystalline habits in plant material. The two chemical forms are CaC2O4-H2O, whewellite, and CaC2O4-H2O, weddellite. Calcium oxalate phytoliths are exposed to high temperature, water vapor, and carbon dioxide in the plume of a fire. 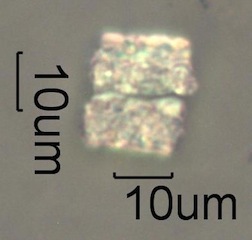 Calcium oxalate converts directly to microcrystalline calcite in the temperature range of 430 to 510 degrees Celsius. If temperatures are higher then calcium oxalate will convert to calcium oxide and then react with water and carbon dioxide to form calcium carbonate. Weddellite is an optically positive tetragonal crystal with refractive indices of 1.523 (w) and 1.544 (e), for a birefringence of 0.021. Whewellite is an optically positive monoclinic crystal with refractive indices of 1.490 (a), 1.554 (b), and 1.650 (g), for a birefringence of 0.160. The pyrolysis products of both tend to be calcium carbonate. The calcium carbonate poly-crystalline aggregate may retain the structure of the original calcium oxalate crystal but the form of the individual calcium carbonate crystals making up that shape may be as aragonite or vaderite tablets or spherulites.